German 3-ton medium truck of the Wehrmacht. At the beginning of 1940 the Germany army had a stock of about 120,000 trucks. From the new production of the automotive industry monthly only 1,000 pieces where be available, which under normal conditions could not even be replaced the wear, in order not to speak of the losses, which were to be expected in the upcoming military operations. Mostly it was in the civilian lorry with which the Wehrmacht used in the campaigns from 1939 to 1941, denied to so-called supplementary vehicles from the private sector or from captured stocks. Much of these trucks again, who already were based on one of the older pre-war construction was – apart from occasional exceptions – did not longer exist anymore after the disaster of the winter of 1941-42 at the latest. From now on, the mass of trucks of the front line troops although further from commercial models, but meanwhile had the haddock program already attained a certain effectiveness, so that the number of types of production was probably still quite large, but now it was reasonably manageable. Mercedes-Benz Type L 3000 A. Built from 1940 to 1943, these three-tonners with all-wheel drive were not suitable for the harsh conditions in Russia. As S-types the respective standard versions were designated, while the otherwise identical A types had four-wheel drive. The S types had the for Four-wheel drive necessary engine parts and could be retrofitted without any particular difficulty, which in practice apparently rarely or never been executed. While the production of motorcycles and passenger cars was considerably limited, the Germans tried to keep the manufacturing of the much-needed trucks at least to pre-war numbers – despite partial utilization of the capacity for other war products. In 1938, 88,000 trucks have been built, which went to 26% to the Wehrmacht. 1939 it reached 102,000 pieces, the highest production, whereas it then until 1943 was about 70,000 to 80,000 units a year. Of those, 80% went to the armed forces and 20% of the war economy. From today’s perspective, these figures look modest, but for those capacity of German automotive factories and among the war-related difficulties they meant a huge industrial and organizational performance. Most important and accordingly build in most numbers was the 3-tons truck, because it could be used most versatile at both: in the army and in the context of the war economy. Among the brands in this size class, the Opel Blitz proven the best. It was the only one of many types of motor vehicles built for the Wehrmacht, which has been under production since before the war to the bitter end in 1945. Approximately 100,000 Opel Blitz 3-ton went to the Wehrmacht, more than any other model, twice as many as for example, the VW Kübel. The Opel Blitz proved on all fronts really as ‘reliable’, and on this it possessed as A-type despite twin-tyred rear wheels an excellent off-road. Contrary to still widespread belief a carriage with rigid axles can be absolutely superior vs independent wheel suspension on cross-country, provided that the latter does not additionally has a to-reach only with great design effort and therefore never been applied in series with suspension compensation. 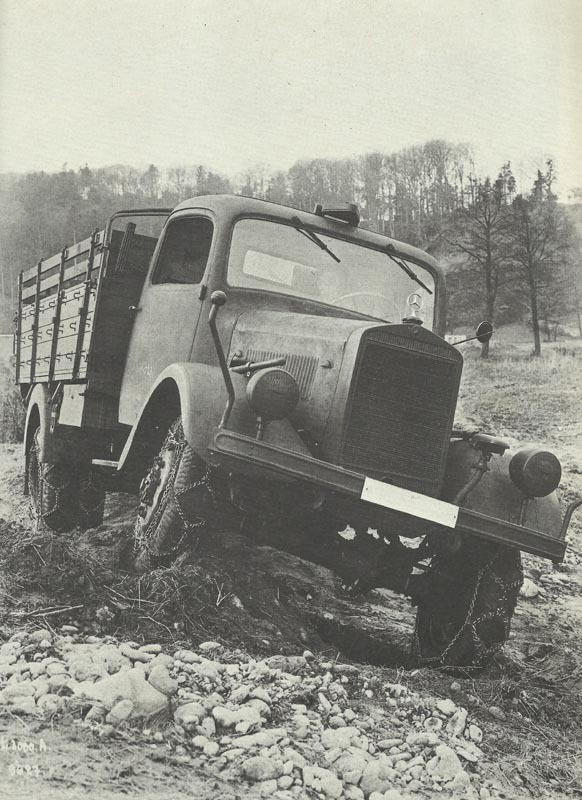 The predecessor, Mercedes-Benz type Lo 2750 was delivered as a 2 3/4-ton truck to the German army. Mercedes-Benz type L 3000 S (1940-1942) with wheel house trailer. Mercedes-Benz type L 3000 S, with a standard box body as a radio or workshop trolley. By contrast, the military-designed Daimler-Benz type L 3000 was not suitable for the harsh conditions on the Eastern Front and too sensitive. The Opel Blitz, originally designed only for civilian purposes, lent itself incomparably better. It can be seen that the engine of an army with special vehicles, although not always very much expensive, but in practice necessarily advantageous. A further good, especially sturdy vehicle was also the Klöckner Deutz-Magirus, and also the Germans could be satisfied with the MAN and Borgward Three tonners. By contrast, suffered the sensitive Mercedes L 3000 more than its competitors under the rigors of Russia, and most was this also for the Ford, although whose V8 engine was used in cars before the war without hesitation ran, while trucks prepared with the former Ford V8 much grief already. Of course, the idea made sense to be built only one or two proven types of all truck companies, and irrespective of their origin. But the change would have cost at the individual plants months of production loss, what the Germans did not intend to accept gladly. Nevertheless, Hitler ordered in June 1942 for the Mannheim plant of Daimler-Benz AG the changeover of production from the own three-ton truck to the Opel Blitz. Meanwhile production began there (after long delaying action) on 20 July 1944, a few days prior to 6 August 1944, at which 40 B-24 Liberator bombers destroying the assembly hall of the Opel truck plant in Brandenburg in a single broad daylight raid from 26,000 feet which lasted only a few minutes. This so far largest European truck factory, which had just reached in July the 2,500 planed production of three-tonners, had to been rebuilt and equipped with new Italian machine tools. When this had done and should go on with the production of trucks, the war was to an end. The factory was completely dismantled by the Russian occupation troops, including the building. The Opel Blitz trucks manufactured at Daimler-Benz wore no trademark or logo. However, they can be identified on the wooden drivers house body, while the trucks from the Brandenburg Opel production were made to last with the original cab of sheet steel. The Opel Blitz should incidentally also be built at Borg Ward, after the 1944 original truck production was already interrupted by an air raid for a longer period. The preparations for the reconstruction of the Opel Blitz 3 to at Borgward were almost complete when the war ended. Planned, but never executed was also the establishment of an Opel-truck factory in Riga.